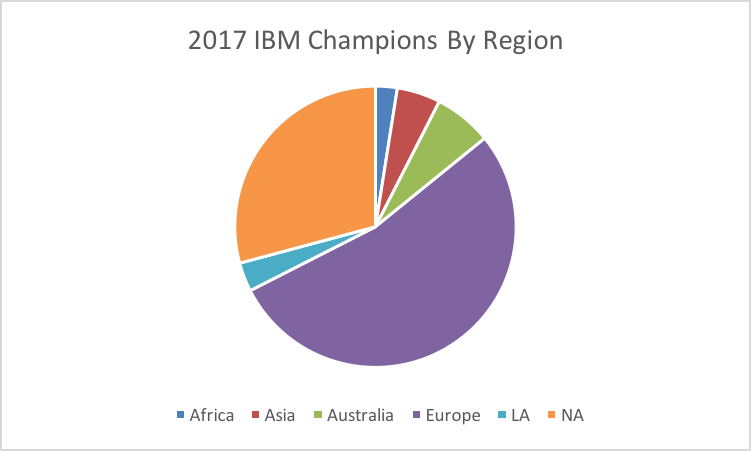 An IBM Champion is someone who makes exceptional contributions to the technical community. Contributions can come in a variety of forms, and popular contributions include blogging, speaking at conferences or events, moderating forums, leading user groups, and authoring books or magazines. 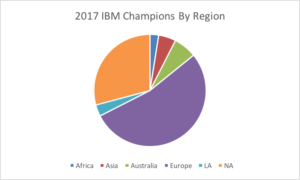 Educators can also become IBM Champions; for example, academic faculty may become IBM Champions by including IBM products and technologies in course curricula and encouraging students to build skills and expertise in these areas. When I started going to IBM and user group conferences in the early 2000s I had never thought I would be among those who could call themselves IBM champions.I used to look up to those guys and girls, and through the years I’ve been able to call a lot of them my friends. I’m also told that I’m the first Norwegian to ever become IBM champion, so I’m very humbled and a bit proud. All I’ve tried to do is to spread the word about the IBM collaborative solutions, which I love to work with, and help people to get the best out of them. In addition to gaining friends and being able to pick up a lot of tips and help myself, I’ve now gotten this distinction. I think the manual I did for the IBM Connections plugins for IBM Notes really helped to put me on the map this year, which I’m thankful for, because it was a lot of work doing that. I’ve also become second in command in the Norwegian user group (ISBG) and I’ve got some ideas which I hope will increase user activity even more. This is really inspiring and I will blog even more about IBM Notes/Domino, Connections, collaborative solutions, internet technologies, plugins and constructive criticism (with the odd complaint thrown in). Also: I’m effectively out of a job from January 1st, if anyone wants to hire me or use my expertise, please get in touch. I can be used for both development, user training, strategy, architecture, writing and documentation and photography! Huge thanks to Roger Johannessen, Oliver Busse and Lars Samuelsson for nominating me! And thanks to all those who sent me messages yesterday to congratulate me. A new Star Wars movie and an IBM Champion award in one and the same day? Xmas came early! Congratulations to Hogne, this is really well deserved! I am so happy to have him onboard in the ISBG board. If you are in need of a great resource for development, user training, strategy, architecture, writing and documentation or photography, I would recommend to hire Hogne at once – before he is fully booked again. Thank you very much, Roger! Much appreciated. Hope to see you at Engage in 2017 as a returning speaker! Thank you, Theo! That’s very kind of you. And I have handed in a sessiong proposal for Engage 2017! Congratulations, I am a new Champion too for the first time. Welcome !